The spotting system is a joke! I keep seeing these cases in 90% of the battles! Strv S1 with 6 skills, 64,83% camo, ventilation, binoculars, food and 511 meters view range, 4-5 lines of bushes in front of me. 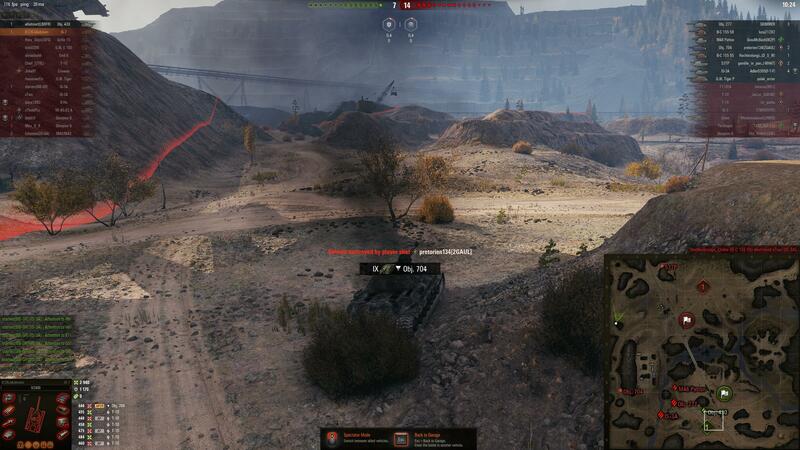 Case 1: an E25 and KV-3 both 2 squares away from me, both firing and killing my team mates and I can't spot them! 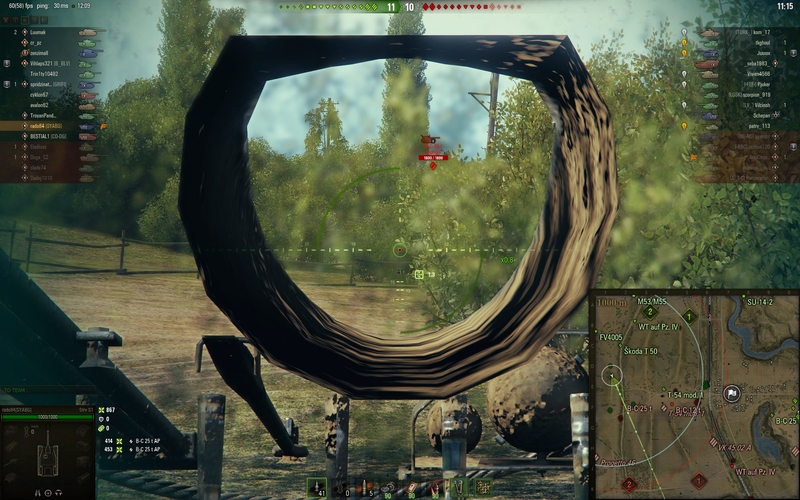 I agree that the E25 has high camo but KV-3 is a camo joke, so I should spot him the moment he fires. Case 2: A heavy tank rushes through an open field on the map, I'm standing still (therefore the 511 view range is active) and I spot him literally seconds before he rams me. Case 3: On Himmelsdorf I'm on K1 and I can see fences and other breakable objects being destroyed and I know someone's coming towards me but I can't spot them. 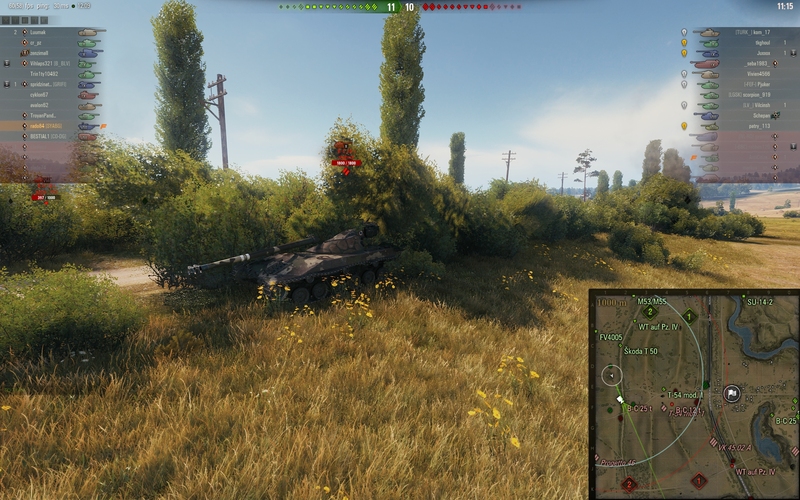 That was an IS-3 which has a ridiculously low camo when moving and yet I couldn't spot him. He showed up when he was in less than 2 squares from me. The other ridiculous thing happened several times on Prokhorovka and/or Fiery Salient - I can't remember which one of the two. There's a circle of bushes on D1, so I stop there in a way that all of the bushes around me are non-transparent, the 511 view range activates and wait. Not moving, not shooting, no nothing. Suddenly the 6th sense lamp activates because a SP I C somehow has spotted me somehow from G1. With all the necessary skills, ventilation and binoculars he should be able to spot me when he comes to 188 meters from me. When I aimed at him, it turned out he was 392 meters from me. You gotta fix the spotting system, otherwise I see no point in buying premium stuff anymore. Edited by wsatnutter, 19 January 2019 - 11:24 AM. You gotta learn the spotting system, that's all there is to it. If you have 4-5 lines of bushes in front of you, no snowball's chance in hell you will spot anything in that direction. At 15 meters distance to a bush, once it becomes 'solid' and you cannot see through it anymore: that's your clue you won't spot anything either. As for your 3 cases, please provide the replays so we can take a look and try to ascertain what really happened. 1. When ingame, go to the settings menu and activate the recording of replays. Voila, spotting system will start to work perfectly. When you happen to get one of those "weird" matches again, upload the replay to wotreplays.com and share the link here with a short description of what happened. Many bushes are broken since 1.0. I am aware some are, but many is too vague to be useful here. Besides, without replays it is impossible to ascertain whether OP here is just making stuff up, these situations as described can be explained through game mechanics, or something wonky actually is happening. I know the spotting system quite well. Just because I'm new to the forums doesn't mean I'm new to the game as well. I have deleted the replays 2 days ago but no worries - the next time this absurd happens again, I will upload it and share it. Bushes are so 2016. It's all about twigs now. 704 sitting in front of me at the entrance of the narrow mid path. Spotted when fired with only the outgrowth of the sad excuse of a tree between us. And then there was the classic Paris twig. I think they fixed that one. Here's one fresh replay, made just a few minutes ago. What's the point of having 511 view range when I can only spot vehicles within 150 meters from me? Battle count suggests you are, but could be another account of course. If so, then despite having played the game for some time you still do not understand the spotting system. You claim you do, but your starting post suggests otherwise. Replays shows you clearly don't understand spotting mechanics. For those interested: OP is parked at the junction of D1 and E1 alongside the road on Prokhorovka. He has bushes 15 m or more away in the direction of the other team thus won't be able to spot anything coming from that direction. Enemy BatChat 25t pops up just under 150 meters (timestamp 11:15) wading through the bushes alongside the road, no longer covered by aforementioned bushes blocking OP his LoS: it is now to the side of OP where OP actually has Line of Sight (and thus gets spotted only then). OP then fires, gets spotted, and gets destroyed soon after. Edited by AliceUnchained, 19 January 2019 - 01:30 PM. And you are definitely not running food, so you don't have view range maxed out. I assume you are talking about this batchat, who moved up through the cover of multiple bushes, and got spotted as he left them? We can see here that the bottom left circled bush is transparent - it's covering you, but not affecting your ability to spot. But all the other bushes? They all affect your ability to spot by blocking your view. The bushes the batchat was behind are layered, and no, I'm not going to bother counting how many you had to be able to see through to see them. In the open, assuming that he is also not using consumables, you would spot him at 366.89m. 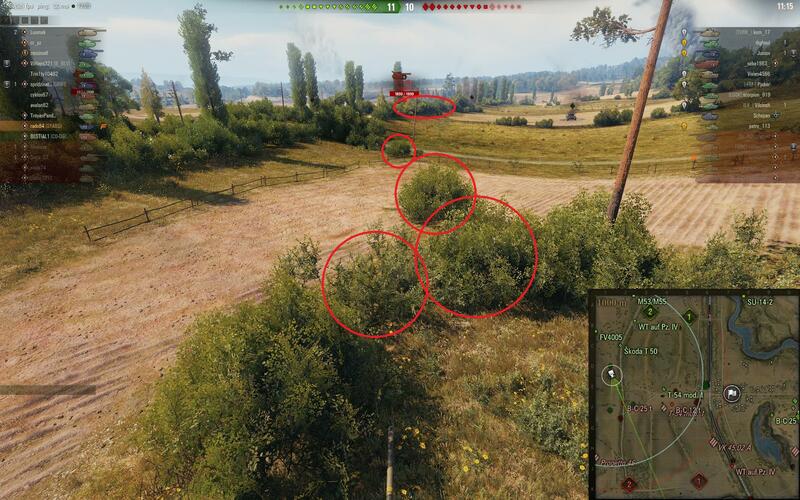 All those bushes and you only get just over 50% retardation of effective view range? I think your commander did a bang up job myself. oh and OP, if you had backed up before shooting the batchat, or just not fired, you wouldn't have been shooting through bushes <15m (remember that bush I noted earlier?) and wouldn't have been instantly taken out once you got spotted. Edited by Baldrickk, 19 January 2019 - 01:30 PM. Thorough, clearly explained, with screen shots. Dear OP, that is why we ask for replays. Most of the time what is described initially, is not what we see in the replay, and practically all the time the 'issue' can be explained perfectly within the existing game mechanics. If I were you I'd say thank you to Baldrickk for taking the time to explain this, and use this as a learning opportunity. I saw an actual replay and had to jump on and look at it. It's such a rare beast. Oh I know, I was actually about to respond to OP his promise he'd upload and share one next time in a rather skeptical way when I noticed the follow up post with link. Immediately watched it as well of course, and saw nothing suspicious. -. all this view range is pointless when you are constantly sitting behind a non-transparent bush, which blocks your ability to spot enemies. .... I thought the purpose of standing BEHIND the bus is to prevent being spotted when firing. Clearly, that's not the case anymore. bushes only give you a bonus on your camo value, they don't automatically "prevent being spotted". An enemy that is close enough will spot you even when you are behind a bush. That is and always was the case. Ah, I missed the description. Which just further underlines my earlier suggestion that OP does not in fact understand the spotting mechanics. And yes, this is another account just for the forum cuz with rado84 I get only a blank page when I attempt to post in the forum. I tried everything to make it work and when it didn't, I decided to use the backup account. I read all you said and I still claim the spotting system is a joke. Maybe you're right about bushes, maybe you're not - the fact is the spotting system wasn't this crap before 1.0. And also, just wait for the next replay to explain it to me how a 70 tons heavy tank disappears while moving 250 meters from me and how he shoots at me without being spotted on Wienersdorf. Then I wonder what else you're gonna make up to justify somebody's incompetence in WG. So Baldrickk was wrong in stating that the Strv S1 cannot reach 511 effective view range. Doesn't change the fact that you did not have it in the game for which you provided the replay. No maybe's at all, he is right. A single bush more than 15 meters away will always block LoS, and prevent you from spotting enemies in that direction. Multiple bushes will only add to that inability. This was the case before patch 1.0 as well. The reason you could not spot that BatChat 25t sooner is exactly because of that. Once it comes into the side where you are less than 15 meters away from the bush in that direction, you instantly spot it. With the BatChat 25t that close, and you firing within 15 meters of the bush in between, the provided camouflage provided by said bush drops immensely and you get spotted as a result. Edited by AliceUnchained, 19 January 2019 - 02:00 PM.